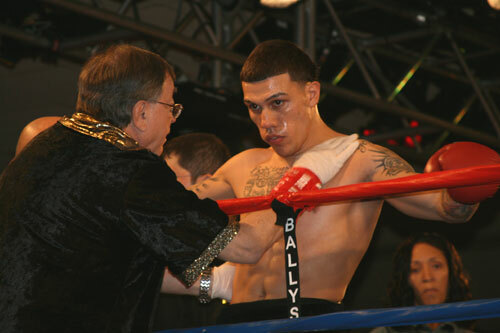 North Philly junior middleweight Gabriel Rosado won his important 10-round semi-windup at Bally's Atlantic City Saturday night (Feb. 27, 2010). His fight was the supporting bout on a nationally televised pair of fights headed by Mike Jones and co-promoted by Peltz Boxing and Top Rank. The victory by Rosado, a split decision over veteran Saul Roman, was a gritty, tough, close, and messy brawl that had the sold out live crowd of about 1,500 and a home TV audience on their feet, woozy with blood lust. It was Rosado's latest stop on the hard road toward the goal of making it to the top of the 154-pound division. Other recent stops on Rosado's journey have produced mostly wins, often in bouts against far more seasoned foes. He hasn't been served up very many "gimmies" along the way. But he has made the best of his opportunities and in doing so, has proven himself to be a fighter willing to face anyone, regardless of the pre-fight odds. Rosado's efforts thus far have produced a ring record of 14-4 with 8 KOs. Gabriel's win against Roman was not pretty. His developmental deficits were on display. He got hit a bit too much and he hesitated a bit too much. No; it wasn't pretty - but in so many ways his victory was beautiful. Especially watching the replay on TV. At ringside, Rosado fans were nervously wringing their hands as the bout progressed. Roman jumped out to an early lead, and looked slick and skilled. But Rosado once again proved that he is able to gut out a win when the chips are down. The fight seesawed from round to round. They swapped punches throughout and traded the lead a few times in the fight. In round six, they both suffered cuts - apparently from a clash of heads. Roman bled first, and it looked like Gabriel finally had a clear advantage. However, moments later, he too was bleeding. It was the first time Rosado had to deal with the gushing of his own blood, and he did well. He didn't get riled; he just fought through it. As the fight wore on, it was clear that Rosado was stronger physically. But it was one of Roman's physical advantages - his extra-long, 80 inch reach - that confused Rosado and almost swayed the match. Figuring out how to work around the reach was difficult, and it caused Rosado to wait when he needed, more than anything, to throw punches and move forward. But he found an effective body attack and relied on his excellent conditioning down the stretch. When the fight was over and the fighters waited for the decision, no one knew for sure who would walk away with the win. Even a draw wouldn't have surprised many. The official scores gave Rosado the close split decision (96-94, 96-94 & 93-97). The TV announcers had Rosado ahead by a couple of rounds. A day later when the pressure was off and the nerves were gone, my tape of the fight revealed that Rosado had won the fight clearly - but closely. The victory upped his record to 14-4. A lumpy resume by some standards. But when one considers the tough matches in which he has been placed, the record looks pretty good. So often Rosado has been put in with opponents who, on paper, he had no business fighting yet. But Rosado has worked hard, kept a great attitude and continued to move forward, no matter what he's been up against. Along with his trainer, the wise-young corner man Billy Briscoe, Rosado has done well - even without a manager. For the past few years, Rosado has represented himself. It has made his ride bumpier than it might have been, had he had someone watching out for his interests. He does not have the luxury of matchmaking with his future in mind. If he did, he'd probably be doing better. But this tough road is making him a formidable fighter with very solid experience. His wins over Roman, former champion Kassim Ouma, fellow Philly prospect Latif Mundy, and then-undefeated sensation James Moore have put his ability on display. The setbacks that he has suffered, most notably a TKO loss to wrecking machine Alfredo Angulo and a points loss undefeated Fernando Guerrero, were poorly timed matches that could have been wins on a perfect night. But Rosado is not a perfect fighter. He is a throwback to an earlier era when a loss wasn't considered the end of the road. In those days a fight was a fight. It paid the bills and kept the fighter moving. Even a loss was a life lesson that might pave the way for improvement and future success. The goal always was to leaving the fans happy. And Rosado always does that - especially in his latest ring start. So with this satisfying win, Rosado and trainer Briscoe can briefly enjoy the buzz and slaps on the back while Gaby's cut heals. But before long, they'll be back in the gym working and waiting for an opportunity that might put them on the road to the top. The attitude and crowd-pleasing style are honed. Now they just need to work on a couple of nagging deficiencies that once fixed, may transform Rosado from a crowd-pleasing throwback to a legitimate world-class fighter.